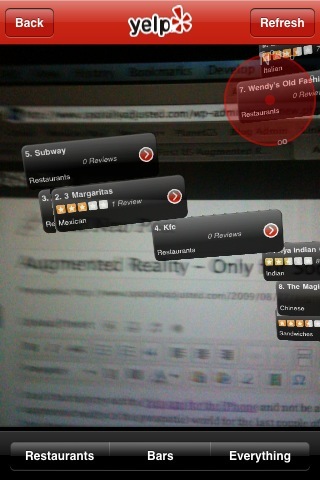 I can’t but help try out the Yelp app for the iPhone and not be amazed. We’ve all been lucky enough to see augmented reality in the geospatial world for the last couple of years, but not at the consumer level. For most of us, the closest we got to augmented reality was when we road in a Lincoln Town Car that projected the digital speedometer on the windshield. Clearly though we are much further along than that considering that my iPhone can find Margaritas while I blog by just holding up my iPhone. But really has my head spinning is what if there was such an app like Yelp that helped you discover spatial data? WeoGeo uses maps to help you find spatial data, but what if you just used your smartphone in the field and walked around seeing what datasets where available? Now tell me that wouldn’t be useful!